The book is described as a combination of Neil Gaiman and Trenton Lee Stewarts’ Mysterious Benedict Society. And it is, but it is also its own wonderfully sinister creation. This is not a writer nor story that sugarcoats disturbing events! 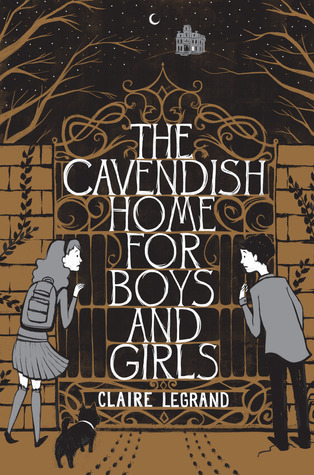 Part fable, part fairy tale, and all horror story, The Cavendish Home for Boys and Girls is a veritably frightening, gruesome, and beautifully written story. Victoria Wright likes everything to be just so. She is a perfect student, an overachiever, and top of her class (well, in everything but music). Lawrence, a disheveled classmate and brilliant piano player, is taken on by Victoria as a project. She hopes that Lawrence will learn from her perfection or, at the very least, that she may make him over as a more put-together, presentable boy. But as their peculiar friendship grows, strange and malevolent things are happening in their picturesque town of Belleville. Cold, forceful winds; strange whisperings; scuttling, noisy pinching roaches; and a frightening talk with a teacher prick Victoria’s interest- and annoyance. It seems that only Victoria notices that adults and classmates around her are acting very strange, very robotic, and unlike themselves…and she seems to be the only one who dares question things when children and adults alike start disappearing at monstrous rates. When Lawrence disappears, Victoria takes it upon herself to uncover and discover the Cavendish home- and bring Lawrence back. I think Legrand really excels in making her descriptions of the supernatural and terrifying occurrences inspire intense emotion. There is something to be said for a children’s novel which can invite emotional and visceral reactions. There are more than a few passages where I felt uncomfortable, blanched more than a little bit, and more than a few passages where I felt such a venomous hatred for the villains of the story that I had to close my eyes! I would recommend this read to anyone who enjoys macabre fairy-tales, and/or writing along the lines of J.K. Rowling, Jane Yolen, Jackson Pearce, Neil Gaiman, Gail Carson Levine, and the Brothers Grimm. I thought the ending of the novel was so very ominous (and devious) that it left me wondering if we may ever hear about Victoria or The Cavendish Home again. Note: This review, written by me, originally appeared on Fabbity Fab Book Reviews. Minor edits may have been made.